We are excited to tell you about Zentangle Apprentice™ and announce the release of our Zentangle Apprentice Classroom Pack #1! Please enjoy this introduction to our new product designed to reach youths in schools. We had a few seats come available at the last moment for our August CZT seminar. Info below. A handful of students changed their plans at the last minute and we now have a few seats available for our Certified Zentangle Teacher training on August 12-15, 2012, in Providence, RI. If you are interested in attending, please email Martha Huggins right away at martha@zentangle.com. Learn more about our CZT seminar here. 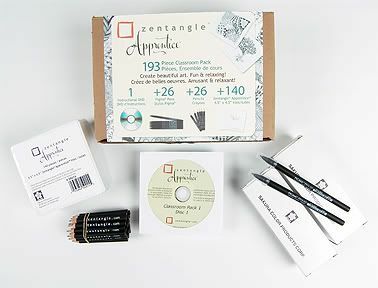 Zentangle Apprentice is a brand we have been developing to bring the Zentangle method and experience to children. Our first project is the Zentangle Apprentice Classroom Pack #1 which is designed for youths in schools. Zentangle Apprentice Classroom Packs will communicate our original intention for Zentangle in schools where Zentangle is part of their regular curriculum. Classroom Pack #1 is our first Zentangle Apprentice product. This product is packaged and distributed by Sakura of America under license from Zentangle, Inc. The DVD includes guided instructions for one tile using four tangles, three additional tangles, and a background introduction. Click this link for Sakura's Info Sheet. Click this link to access the Zentangle Apprentice web page. Classroom size packaging and materials that are designed for school budgets and, in some cases, a younger person's hands. Please take a moment to read some teacher comments below that show how this vision is playing out in actual practice. As we were developing this product, we tested it with some of our CZTs who are also education professionals. "As a CZT and art educator, both in private and public educational venues, Zentangle has been a successful art form to get students to an internal place for creating art. Letting go of preconceived images and accepting art with its imperfection is quintessential Zentangle. This "as is" acceptability of nontraditional methods allow the student to let go and experience the process. This new thinking translates into other artwork and schoolwork. It is a place to reintroduce focus into our students' lives. "This peaceful focus is where I encourage my students to get comfortable. Many have discovered a new place and look forward to returning often." "I taught the Zentangle method to a group of third-grade students at an inner-city school in Worcester, MA. I am a Title I teacher, and I work with students throughout the school. I decided to teach Zentangle to the class of students with whom I spent the most time, as a fun end of the year activity. "The students were enthralled by the Zentangle method. They were completely focused and attentive throughout the lesson and eager to learn more tangles afterward. One interesting thing I noticed was that most of the students constantly asked me if they were "doing it right", despite my having said that there is no wrong or right in Zentangle. They also asked for permission, or if it was "okay" for them to do a certain tangle in a certain section, or do a tangle in a slightly different way. "It really showed me that these students are so used to following explicit directions and being assessed on their work that they had a hard time unleashing their creativity and trusting themselves. However, by the end of the lesson, the students were more relaxed about their creations, and they loved seeing how their own Zentangles were similar and different to those of their classmates. "Creating a mosaic of all the students' finished Zentangles at the end was very powerful. The students really appreciated how each piece of artwork became part of a larger work of art." Zentangle Apprentice is just beginning. Your questions, suggestions and feedback will help shape the growth and applications of Apprentice.